This is the third of such a letter. The previous ones can be found here and here. Today, I’d like to write to you about the Realisation relation and subsequently about Composition. As the relation between ‘internal’ behaviour and ‘external’ behaviour within a layer. I’m going to address the latter now. […] we make a distinction between an external view and an internal view on systems. When looking at the behavioral aspect, these views reflect the principles of service orientation. A service is defined as a unit of functionality that a system exposes to its environment, while hiding internal operations, which provides a certain value (monetary or otherwise). Thus, the service is the externally visible behavior of the providing system, from the perspective of systems that use that service; the environment consists of everything outside this providing system. […] For the external users, only this exposed functionality [is] relevant. 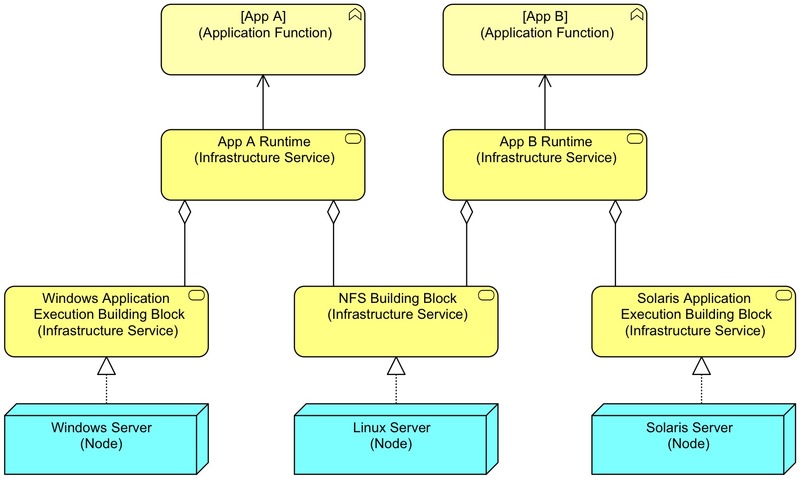 […] Services are accessible through interfaces, which constitute the external view on the active structural aspect. An interface is defined as a point of access where one or more services are made available to the environment. An interface provides an external view on the service provider and hides its internal structure. In my opinion, there is a fundamental problem here. I am going to explain this with a simple example: The Flower Shop. We are going to model a very simple flower shop. In this shop, the customer enters, requests a beautiful bouquet. The details are discussed with the sales employee at the counter who then goes into the back and tell the floral arranger in the back what to create. The floral arranger creates the bouquet and it is given to the sales employee, who gives it to the customer in exchange for money. The customer interacts only with the sales employee. 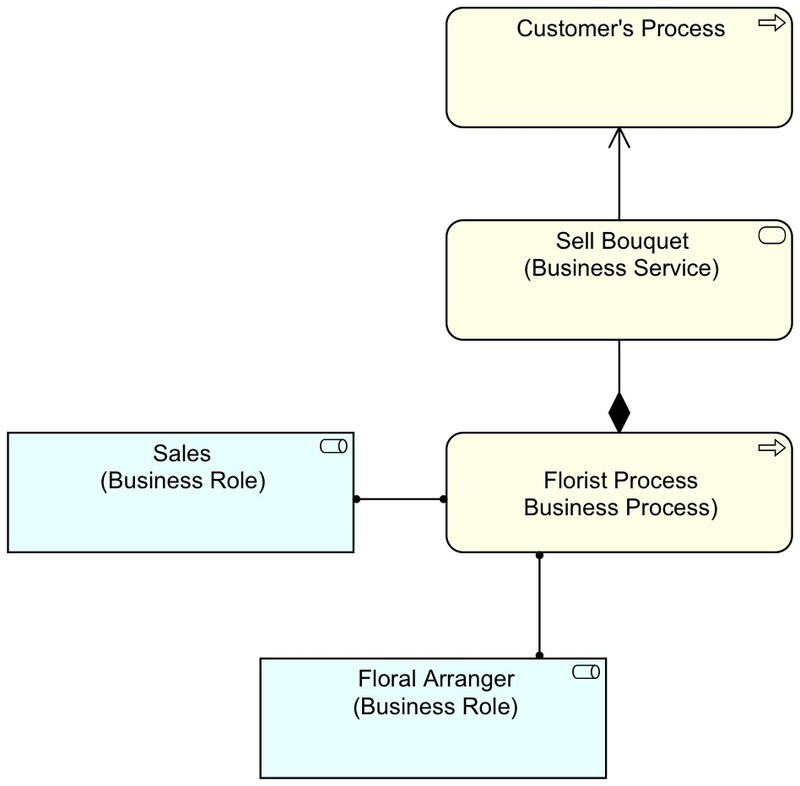 The sales employee’s behaviour is what the customer’s behaviour (his ‘process’) interacts with, so that part of the flower shop is the ‘external behaviour’, the service. The behaviour that takes place in the back is invisible to the customer, so it is the ‘internal’ behaviour. We make things simple by assuming that the internal behaviour is only the flower arranging, not the interaction between sales employee and flower arranger. I’m using Informal Collaboration here instead of the official Collaboration/Interaction elements which I discussed in a previous letter. The customer’s process uses all the behaviour that is in the upper lane, it is that which is visible to the customer. It is — I think — clearly “exposed to the environment” as the specification tells us. We are all aware that the application and its user interface are not really separable, are we? So the Application Interface in ArchiMate is part of the Application Component, but on the behavioural side we do it differently. You might be tempted to argue that the ‘visible’ tasks are not completely visible, but in that case you are going to make another split (e.g. 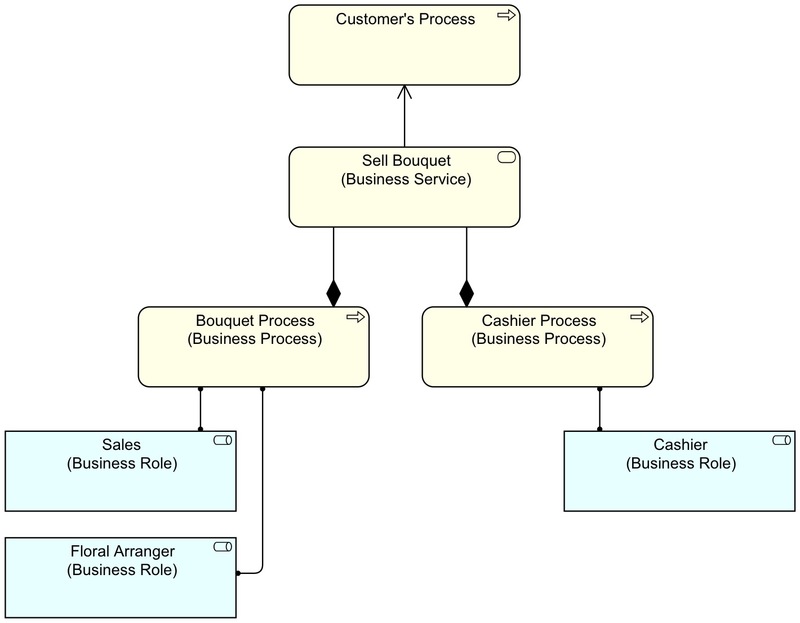 splitting ‘Get Order’ in a part that the customer sees and a part het does not (e.g. entering it on the computer). But that does not help: whatever you split, the part you call ‘visible’ is still behaviour of the Sales employee and thus still part of the process. In other words: the internal/external separation in ArchiMate is inconsistent, it should be external/whole and not external/internal. 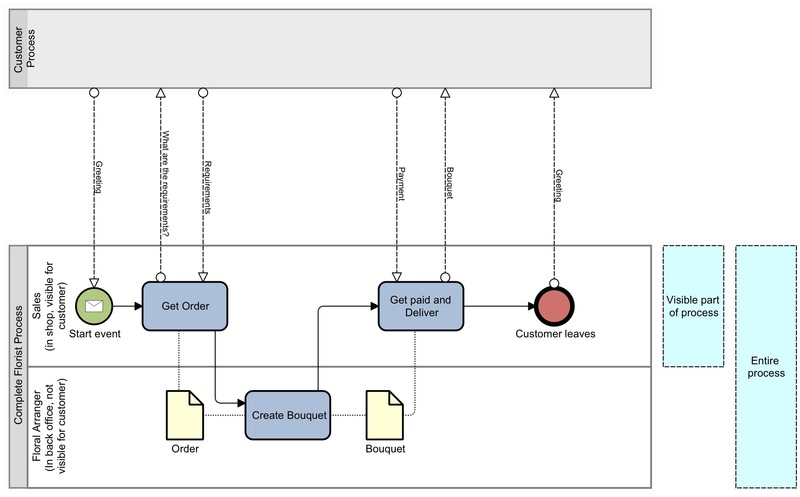 As long as you stay within ArchiMate this doesn’t really trouble the modeller, but as soon as you want to consistently model in multiple environments (BPMN used here as the other environment) you’re in trouble. This is forbidden in ArchiMate, not just because we are using Composition, but because Composition is defined such that it forbids multiple parents of a child. This is an influence from software engineering. In software engineering of old, memory sharing (two pointers to the same piece of memory), dangling pointers and memory leaks have been major sources of bugs in programs. Hence: they are not liked by programmers. Hence the strictness about ownership; e.g. UML forbids it. But we are enterprise architects and not software architects, right? Do we have a risk of ‘dangling pointers’ and such in ArchiMate? Is it that bad that software engineers, used to UML balk at this? How bad is it that software engineers have to learn that the world is not like software? Oh, and by the way, we already do have this ‘problem’. Multiple parents of a Composition in ArchiMate are already unavoidable as I showed in a blog post in 2013 and one in 2014. That older blog post, by the way also explains that the Realisation relation between ‘internal’ en ‘external’ behaviour can be seen as outdated ‘heritage’ in ArchiMate. After all, the idea of a service as some sort of abstraction partly comes from the fact that ArchiMate 1 and before did not have the Motivation Extension with its Requirement element. The services in historical ArchiMate had to fulfil those roles too, but that is not necessary anymore. One thing we cannot do now is to derive relations between the Nodes or Building Block Infrastructure Services and the Application Functions. But what if we would be allowed to do this? And what happens when the Linux Server dies? Well, our applications cannot function because they both depend on that Node for the shared NFS shares. 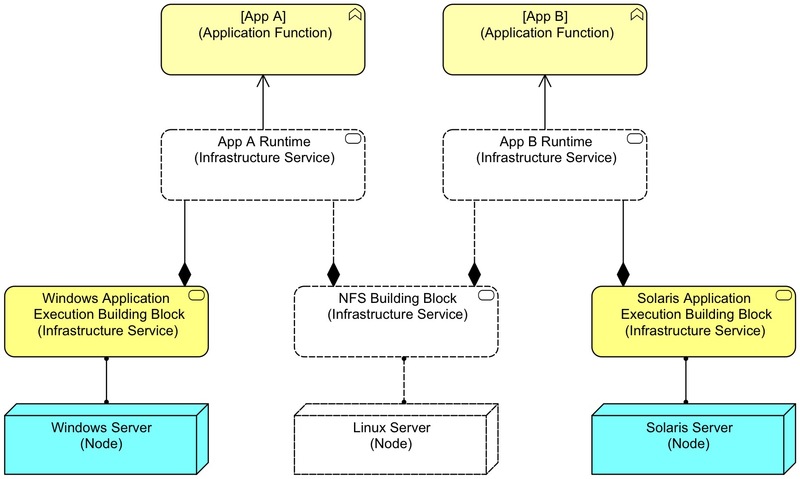 This is perfectly shown by the fact that both runtimes (which are made up of building blocks) are unavailable when the NFS server is unavailable. I’m proposing to fundamentally adapt the internal/external split to a whole/visible-part (or whole/usable-part) split. The split is not consistent, neither internally, nor when looking to the world of processes. 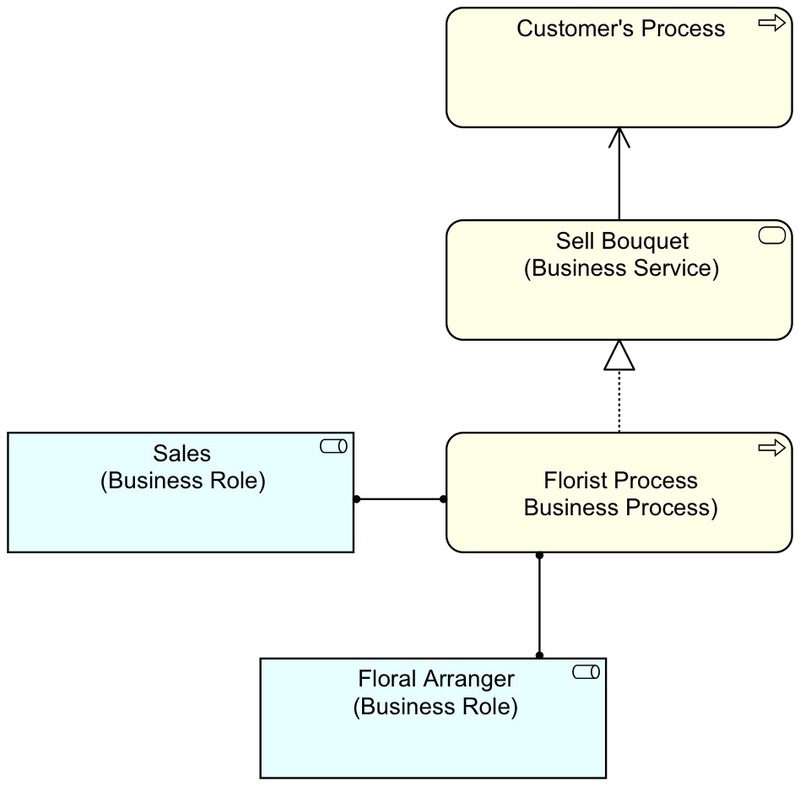 I’m proposing to use Composition as the relation between process/function and service, thus simplifying the language. I’m proposing relaxing the limitation of single-parent for Composition. It can still be valid in software engineering parts of your enterprise architecture, but ArchiMate is not a software engineering language and enterprise architecture is not (just) IT architecture. Next Entry:What is wrong with this picture? 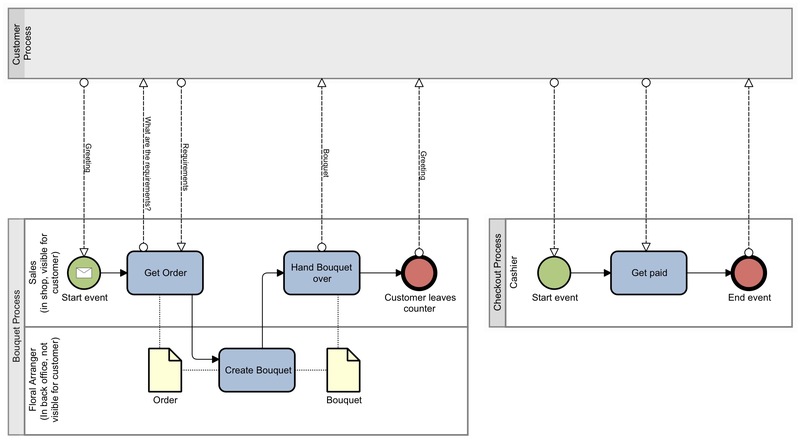 The interesting thing is that visually the BPMN diagrams reveal more information without actively translating the notation.